Like ETFs and mutual funds, hedge funds are another method of using pooled funds to garner alpha returns for investors. Hedge funds share features that present both opportunity and risk. The difference between hedge funds and other pooled assets is the flexibility and variety of strategies available to portfolio managers. Some are short-term and event-driven, others are long-term and macro, depending on the style of the firm and its managers. Typically, portfolio managers will take short positions in securities as well as long positions that benefit from rising valuations. They also use borrowed cash to amplify returns. Unfortunately for investors, this flexibility is not universal. Investing in hedge funds has its requirements. It comes at a price, and presents the largest risk. Even further, hedge fund investors often must commit their money for three months or more, and portfolio managers have the right to limit withdrawals. Currently, the largest hedge fund firms are Bridgewater Associates, J.P. Morgan Asset Management, Brevan Howard Asset Management, and Och-Ziff Capital Management Group. Up until very recently, hedge fund clients were limited to the very select upper echelon of investors. These are wealthy clients with a net worth of at least $1 million, but usually more. We call them “sophisticated investors." The SEC basically believes that if you are a person with that much money, you also have some level of investment savvy. Hence, they will essentially allow you and your hedge fund manager to play with (and possibly lose) that money however you like — as long as it’s legal. Unfortunately for investors, there are a handful of completely legal practices used by hedge funds that still make them completely undesirable. The short answer here is that hedge fund managers essentially steal money from their clients with every trade: They do it through fees. As previously mentioned, exclusive status as a ‘sophisticated investor’ comes with a price: “two and twenty.” The hedge funds pay themselves 2% of all the assets they oversee, and 20% of any gains over the year. With fees like that, you’d probably expect to see significant returns on your “sophisticated” investments. If profits are flowing, then “two and twenty” isn’t so bad, and everyone is making money. Unfortunately, based on a variety of measures, hedge fund performance is average at best. In every year since 2002 — even during recession and plateau years — the typical sixty-forty portfolio outperformed the average hedge fund. Between 1994 and 2011, hedge funds generated an annual return of 6.5%. That’s about the same as the stock market and less than bonds, which generated 7.2% returns. In the last five years, the stock market has done nothing but go up, while hedge funds remained mediocre with returns of 4.8% per year compared to the S&P 500’s 14.3%. So, we need to hand over 2% for those handling fees. These are universal, no matter the outcome of your investment. Then, take away 20% of any gains… (most hedge funds try to show a little humanity and good faith, and won’t charge an extra incentive fee unless returns exceed 5%.) Either way, that 6.5% has been knocked down to a fraction. And that’s if you generate any profit at all. No matter how you look at it, the numbers are clear. Hedge funds do not outperform the stock market. However, hedge fund managers are outperforming you. After the 1990s, the number of hedge fund firms grew immensely, especially as people noticed the exorbitant amount of money in managers’ pockets. To achieve a further reach and gain a competitive edge, some funds began loosening the requirements for investment. Rather than require high-profile clients with a net worth in the millions, investors with just several thousand can now throw their money into the murky, mysterious waters. In the face of growing criticism regarding their fee structure many hedge funds have altered the ‘two and twenty’ model. But the fact remains that hedge funding is the only field of work where employees are compensated even for poor performance, and their clients are footing the bill. The entire industry is designed to filter money back into the hedge fund. Ultimately, these are complex financial institutions. Sure, not all of them are inherently evil. There might even be a few out there that can help you turn a profit. As hedge funds continue to compete for investors, we suggest that everyone maintain a skeptical eye. Behind all the smoke and mirrors, that hedge fund might fall closer to a ponzi scheme. Remember: their main goal is to make money for themselves. All things considered, we are forced to ask… Why are investors still participating in hedge funds? Why would anyone pay more for less? Fortunately, this is one scenario where investors can have their cake and eat it too. A growing number of mutual funds have adopted hedge fund tactics — shorting stocks, buying futures, etc. However, these alternative mutual funds are more affordable than hedge funds and more transparent. Therefore, investors can know what is in their portfolio and sell on a daily basis — no mystery, no three-month commitment. Unlike hedge funds, alternative funds are regulated by the Investment Company Act of 1940. This puts limits on illiquid investments and leveraging, in addition to diversification requirements. Alternative funds still carry risk and some fees. Some are still quite young, and therefore more risky. However, there are a handful of alternative funds that are worth considering. If you prefer stability, and protection in large market downturns, take a look at the 25-year-old Merger Fund (MERFX). A member of the Kiplinger 25, Merger Fund invests in stocks of already-announced takeover and merger targets in an attempt to hop on the last bit of appreciation before the deal is finalized. Although Merger has trailed the S&P for the last several years, consider its performance during the massive downturn of 2008. When the S&P plunged almost 40%, Merger Fund barely lost 2%. Its performance, especially over the last decade, has shown proven resistance to volatility. As interest rates rise, the fund’s performance should rise with it. 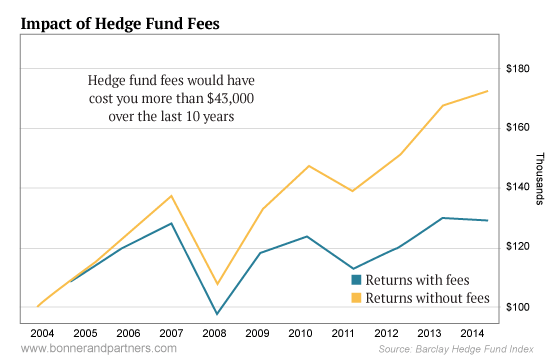 Unlike most typical hedge funds, Merger charges reasonable fees of 1.26% annually. Compared to customary mutual funds, alternative funds use differing strategies from the “buy and hold.” Alternative funds are generally more complex and invest in non-traditional assets: commodities, start-ups, global real estate, etc. In this way, investors can get the best of both worlds: a wide range of assets, hedge fund-like trading, and returns not closely correlated with stocks or bonds.